I have to say this first, my love for the first book did not transcend to this book. The first book was such a wicked read that I was engrossed with it. This story starts with Jade in a monastery. On her 18th birthday, she is requested to come to the palace by Xifeng. While travelling, she sees the condition of her country and it fuels her to overthrow Xifeng and claim her rightful place in the kingdom. Somehow this book was too cliche for me. The writing was good but I was not interested with Jade and her crew. It just felt that Xifeng was a very complex character which made me invest my time on the story. As for Jade, she was just to shallow for me when compared to Xifeng. Both stories had me look at different kinds of people. Jade could be the next Xifeng if she had succumb to the darkness. She did not and became the usual heroine of a story. What I did not like.. I gave this story a 4 hearts rating because it was good but lacked the ingenuity of Forest of a thousand lanterns. I just loved it that this really was lacking. I maybe biased but this story was sort of cliche for me. Heroine goes on an adventure with her friends and saves the day. I do love this trope if executed well. I prefer the authors execution with the Anti-hero trope. However, it was still a good read. I also think that Jade was just a typical character which made the story lackluster. But it was still an enjoyable read with a good ending and a lot of characters. Disclaimer: This review is my honest opinion on the story. I did not receive any kind of compensation for reading and reviewing this book. I am under no obligation to write a positive review. 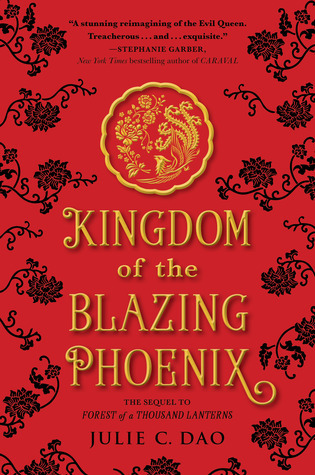 I purchased my own copy of Kingdom of the Blazing Phoenix by Julie Dao. The book photo and synopsis here is from goodreads.com.